Previously unknown method of tuberculosis infection identified. One of the world’s most deadly diseases, tuberculosis, primarily a lung disease, infects more than 8 million people and is responsible for 1.5 million deaths each year. According to the Centers for Disease Control, approximately one-third of the world’s population is infected with tuberculosis. The bacterium that causes tuberculosis, Mycobacterium tuberculosis, or Mtb, previously was thought to infect the body only through inhalation and subsequent infection of cells in the lungs. Now, a study from researchers at the UT Southwestern Medical Center identifies a new way that tuberculosis bacteria get into the body, revealing a potential therapeutic angle to explore. The team states that their new study identifies an alternative route of entry that could have significant implications for the development of new therapies to prevent tuberculosis infection. The opensource study is published in the journal Cell Reports. Previous studies show that the current model of disease is that when Mtb bacteria are inhaled, they reach the end of the lung, the alveolus, and are ingested by a macrophage, a type of white blood cell that swallows and kills invading bacteria. The current study shows that once Mtb bacteria are inhaled, they also can enter the body directly through M-cells, specialized epithelial cells that transport particles from the airway or mucosal surface to the compartment below the cell, and then travel to the lymph nodes and beyond. The current study shows that microfold cell (M-cell) translocation is a new and previously unknown mechanism by which Mtb enters the body. Results show that airway M-cells actively translocate Mtb to initiate infection. Data findings show that depletion of M-cells prevents Mtb dissemination from the mucosa and delays mortality in mice. 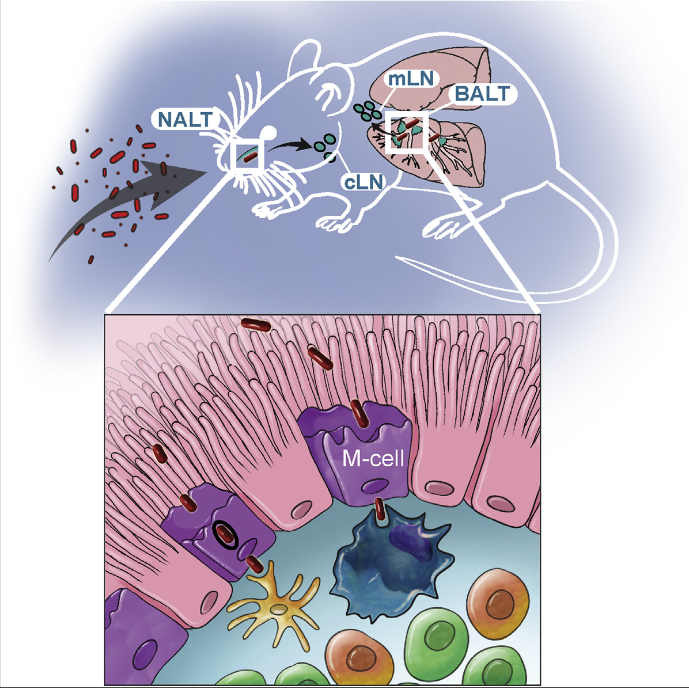 Results show that Mtb invades via M-cells to initiate infection and intranasal Mtb infection in mice lacking M-cells resulted in reduced invasion and dissemination of potential infection to draining lymph nodes. Data findings show that M-cell depleted mice infected via aerosol also had delayed dissemination to lymph nodes and reduced mortality; translocation of Mtb across two M-cell models was rapid and transcellular. The group conclude that M-cell translocation is a vital entry mechanism that contributes to the pathogenesis of Mtb. The team surmise that their findings suggest disease onset outside of alveolar macrophages is not only possible, it is also important for the pathogenesis of tuberculosis infection. For the future, the researchers state that potential clinical applications of their data would involve developing methods or drugs that prevent Mtb from entering M-cells. The lab are currently investigating the human cell-surface receptors for Mtb that are involved in the bacteria’s M-cell translocation, as well as to determine the exact machinery used by the cell to move the bacteria from the surface to the bottom of the cell. The prevailing paradigm is that tuberculosis infection is initiated when patrolling alveolar macrophages and dendritic cells within the terminal alveolus ingest inhaled Mycobacterium tuberculosis (Mtb). However, definitive data for this model are lacking. Among the epithelial cells of the upper airway, a specialized epithelial cell known as a microfold cell (M cell) overlies various components of mucosa-associated lymphatic tissue. Here, using multiple mouse models, we show that Mtb invades via M cells to initiate infection. Intranasal Mtb infection in mice lacking M cells either genetically or by antibody depletion resulted in reduced invasion and dissemination to draining lymph nodes. M cell-depleted mice infected via aerosol also had delayed dissemination to lymph nodes and reduced mortality. Translocation of Mtb across two M cell transwell models was rapid and transcellular. Thus, M cell translocation is a vital entry mechanism that contributes to the pathogenesis of Mtb. Microfold Cells Actively Translocate Mycobacterium tuberculosis to Initiate Infection. Shiloh et al 2016.